In the average backpacking trip, there are a lot of things that people need to prepare from planning a route to organizing the supply inventory. However, in multi-day excursions into the wilderness, virtually every backpacker knows the importance of having a good sleeping bag. It’s difficult to fall into sleep if your sleeping bag fails to keep you comfortable which hinder the recovery of your body at night. But with numerous models available for purchase, how could you and your fellow backpackers get the best backpacking sleeping bags? 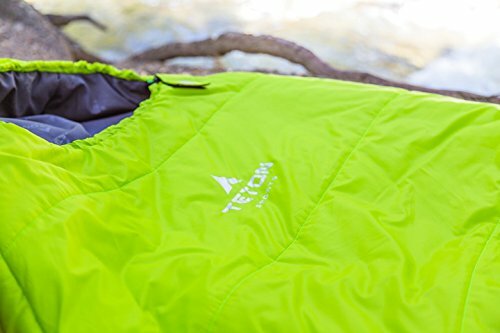 A solid investment for casual backpackers, Teton Sports LEEF is one of the top-rated sleeping bags on the market. Although the Teton Sports model does not excel at any aspects, it’s still among best backpacking sleeping bags in term of all-around performance. Actually, you would have a rather hard time locating another sleeping bag that surpasses the LEEF at its price range. All things considered, the bag is a fairly good starting choice for most novice backpackers. Despite coming with a humble price, Teton Sports LEEF offers backpackers multiple features: full-length baffle, adjustable hood, insulation mapping,… As a result, the sleeping bag is able to prevent the forming of cold spots as the surrounding temperature drops. In addition to that, thanks to the long body, the product from Teton Sports experiences no trouble accommodating tall backpackers. Because the design also incorporates an interior storage pocket, the sleeping bag could take care of your belongings as well. Whatever version you choose, the temperature rating of the Teton Sports LEEF is sufficient for the occasional weekend backpacking trip. However, the bulk of the LEEF is slightly above average which means it might cause some difficulties in extended adventures. That being said, the sleeping bag is a nice way for people to spend a couple of day in the wilderness without emptying their wallet. 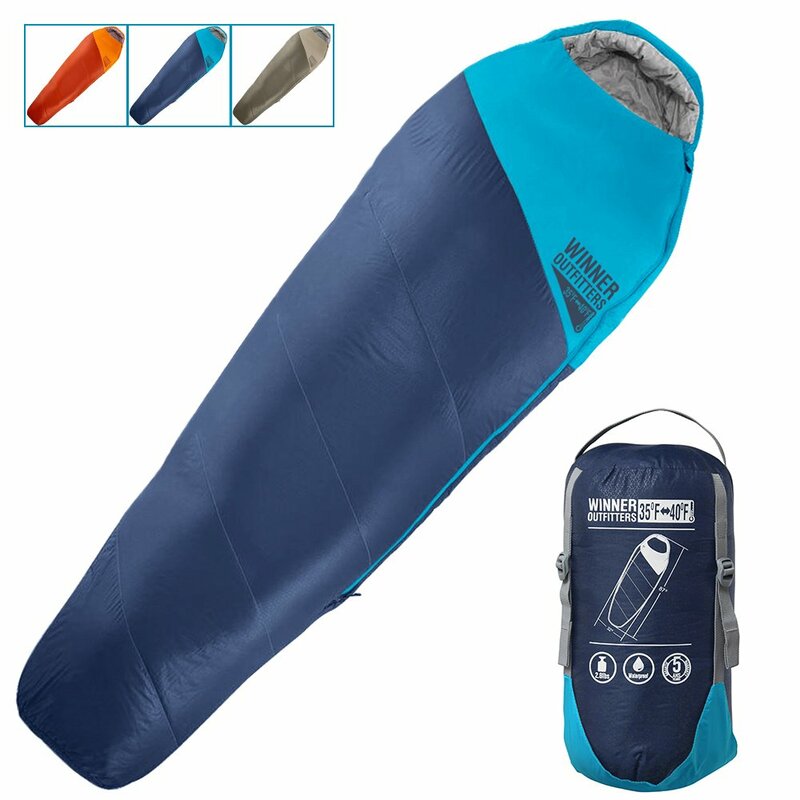 Primarily made for 3-season camping, MalloMe Camping Sleeping Bag is a regular in reviews about the best backpacking sleeping bags. The MalloMe model emphasizes the comfort of the backpackers so regardless of the state of the surface, you always feel relaxed once you lie down. Being a waterproof, weather-resistant product, the sleeping bag holds up together well while facing challenging conditions in the outdoors. A combination of double layer layout and S-shaped stitches prevent you from getting damp. Once it needs to be cleaned, the MalloMe sleeping bag proves forgiving to work with: you only need to wipe clean the surface and toss everything into a washing machine. Hence, MalloMe Camping Sleeping Bag is regarded as one of the best backpacking sleeping bags available for purchase when it comes to ease of maintenance. Since you receive a compression sack with straps after you get the sleeping bag, storage is not exactly a concern. Since the bag is also light, carrying it should be a walk in the park. Depending on the feeling of the backpackers at specific moments, the product from MalloMe could be manipulated through its features: zipper, headrest, Velcro securing strap,… In the summer, if things start to get hot, all you need to do is to open the bottom of the bag for enhanced ventilation. The 100% polyester hexagons weaved fabrics ensure that the MalloMe sleeping bag could stay in one piece for years to come. As the product from Abco Tech is machine washable, it should not take much time and effort for first-time backpackers to clean the sleeping bag if the need arises. Wash the bag in cold water, wait for it to dry and you are ready to hit the road again. Considering the light bulk of Abco Tech Sleeping Bag, it adds a negligible amount of weight to your travel backpack in return for superior comfort. The accompanied compression sack simplifies the issue of transportation as you could reduce the size of the bag while traveling. 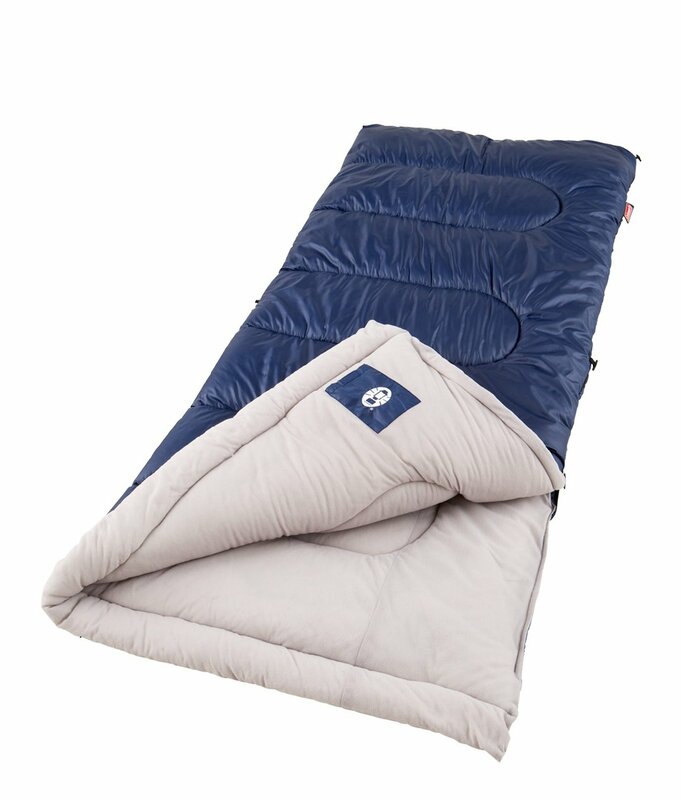 With a mummy-style body that keeps the weight down while retaining heat, Winner Outfitters Mummy Sleeping Bag is a great lightweight backpacking sleeping bag. By using the compression sack, people could reduce the volume of the bag to save precious space for other items. Due to the presence of premium water-resistant fabrics, you don’t have worry about getting damped in the outdoors. Winner Outfitters offer up to 4 color options to choose from so pick what you like. One of the most frustrating troubles when it comes to sleeping bags is snagged zipper and the product from Winner Outfitters deal with that superbly. Incorporating a double zipper anti-snag design, the sleeping bag let the backpackers operate the zipper smoothly at all times. Hence, you no longer have to struggle pulling the zipper of your sleeping bag which might end up broken/bent. Winner Outfitters Mummy Sleeping Bag could be washed in a washing machine but remember to use cold water and gentle cycles. Regarding the insulation quality, Winner Outfitters employs draft collars along with draft tubes to maintain the temperature at reasonable levels. Such features prevent the heat from escaping while barring entry of cold into the interior. With the use of water-resistant materials in its layout, the bag is able to work in high-humidity locations. For backpackers that travel year-round, RevalCamp Sleeping Bag is one of the best backpacking sleeping bags for 4-season travels. Since the RevalCamp possesses lots of internal space, it fits every person up to the height of 6 feet 1 which make it suitable for tall backpackers. 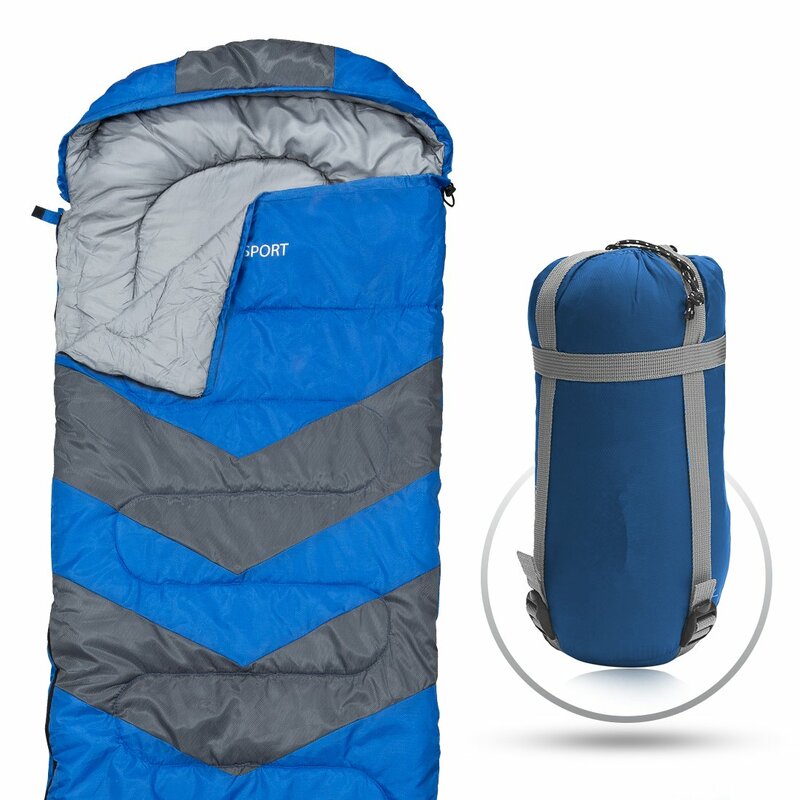 In addition to that, you could combine 2 sleeping bag to make a double bag at moment notice without much difficulty. You don’t have to worry about left and right here, simply place 2 sleeping bags right next to each other, zip them up and enjoy. To let backpackers have a good time with the bag, RevalCamp put in a couple of features such as the double-sided anti-snag zipper. With that design, you would have no trouble operating the zipper as you see fit. Moreover, the fabrics that the RevalCamp model uses have excellent resistances: they fare well against UV ray, weather and water. Therefore, the bag should remain in good shape for quite some time on the field. When it comes to compressibility, RevalCamp Sleeping Bag gets a high score thanks to the compression sack that comes along. Fold the bag, roll it from the end and that is everything, the compressed size of the bag is somewhat comparable to a small pillow. So if you are in need of the best compact sleeping bag, you must check out the product from RevalCamp. In the case you only intend to venture into the wilderness if the weather is not too tough, Ecoopro Sleeping Bag is your best bet. Despite the fact that the temperature rating of the Ecoopro model is unexceptional, it’s sufficient for trips that occur in spring, summer and fall. Boasting premium materials in the outer wall, lining and fill, the sleeping bag delivers an ultra-comfort place for weary backpackers to rest after a long day on the road. In most of the case, the product from Ecoopro could only accommodate 1 adult but for children, it might take in 2. Regarding resistance, Ecoopro Sleeping Bag is both waterproof and weatherproof so you would get quality shut-eye while using it. Aside from the sleeping bag, you should receive a handy carrying sack once you make the purchase which facilitates transportation. After you compress the sleeping bag, it’s not much bigger than a water canteen and that means there are more spaces for other items. 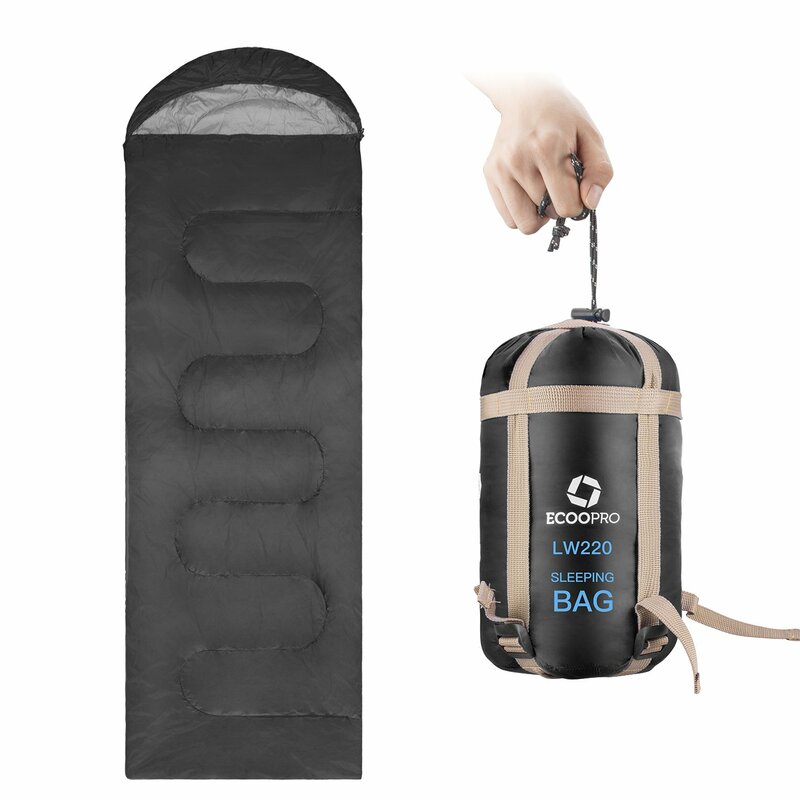 Although Ecoopro Sleeping Bag is primarily designed as a sleeping bag for outdoor uses, it’s versatile enough to match various roles on the field. For example, it’s possible to turn the sleeping bag into a camping comforter within a blink of an eye. If you feel that the weather is getting kind of hot, feel free to toss out the sleeping bag liner. Want to go backpacking with your life partner but have no luck finding a solid double sleeping bag until now? If that happens to be the case, you should spare time to take a look at Sleepingo Double Sleeping Bag. Spacious, rugged and comfortable, the Sleepingo model is recognized as among the best backpacking sleeping bags in the double class. Depending on the current needs and requirements, you could use the bag either as a queen size sleeping bag or as two separate sleeping bags. Being rated at 32°F (0°C), the product from Sleepingo perform fairly well in cold climates so you no longer have to shiver in low temperatures. 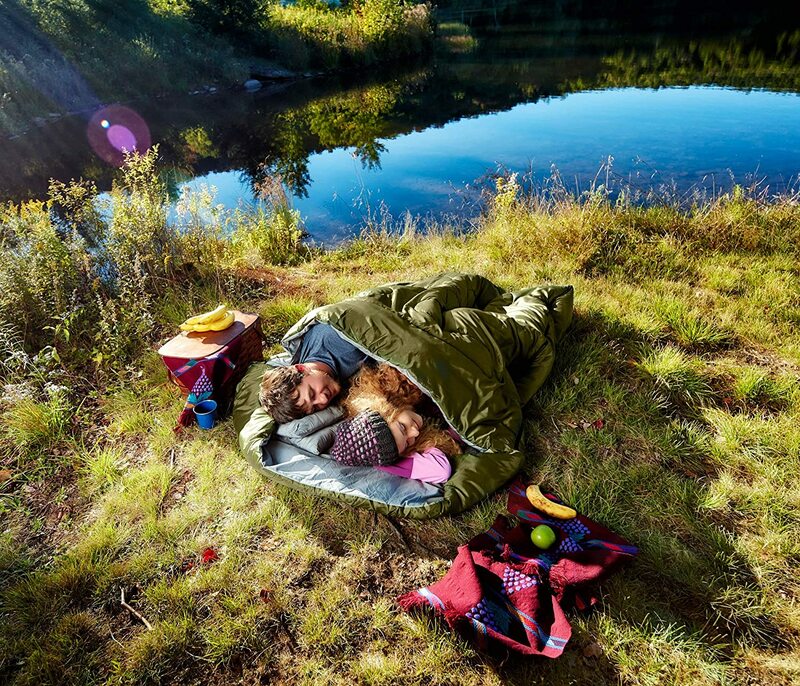 Due to the presence of rugged fabric, tearing is less than a problem with Sleepingo Double Sleeping Bag which means you could move freely inside. In addition to the sleeping bag, backpackers would receive a strap-on sack and two traveling pillows free of charge. As Sleepingo Double Sleeping Bag features convenient zippers on both sides, you don’t have to disturb your loved one in order to enter/exit. The materials of the bags actively resist water immersion so the bag works like a charm while facing wet environments. Another proof of the quality is that the manufacturer backs its product with a lifetime warranty which is uncommon when it comes to sleeping bags. Soft, warm and light, Teton Sports Celsius XXL is a wise investment for backpackers that want to have something straightforward. With the innovative fiber-fill design, the Teton Sports model shall keep you comfortable if the temperature drops too low. As the volume of internal space is superb for one user, you don’t have to worry about feeling constrained. 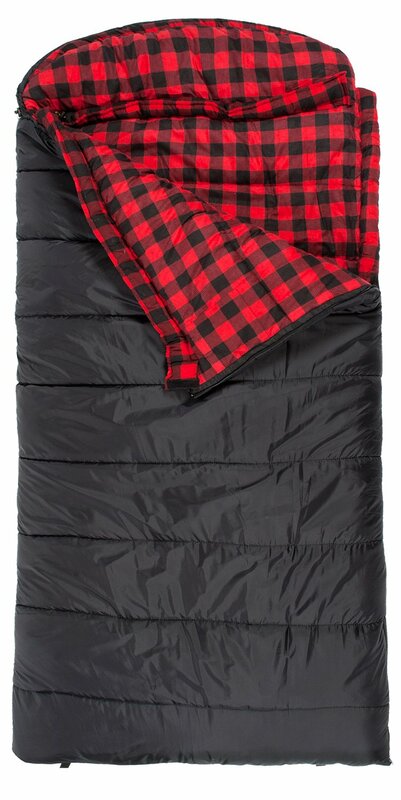 The hood of the sleeping bag possesses enough room to support a compact pillow. 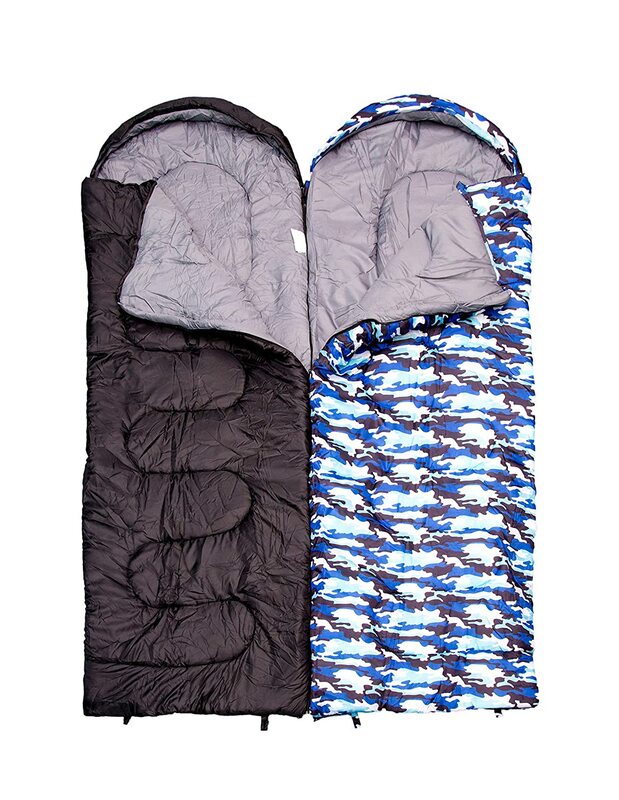 Hate to deal with sleeping bags that require you to roll them neatly before packing? Well, the product from Teton Sports could save you the hassle with its compression sack. All you have to do is to stuff the bag into the sack starting from the bottom, tighten the straps and that should be it. For most of the time, the sack guarantees that you could transport the Celsius XXL across extended distances without trouble. In its compressed form, the sleeping bag permits most backpackers to get the most out of their backpack carrying capacity. When it comes to features, Teton Sports Celsius XXL got everything that the average backpackers expect in a sleeping bag. To tighten/loosen the hood of the sleeping bag, simply grab the drawstrings and begin adjusting till you are satisfied. The sleeping bag is designed with an interior pocket as well so could throw in there your belongings like wallets, keys, phone and similar items. Coleman is a reputable name in the business of camping goods that deliver high-quality products to customers and Coleman Brazos is not an exception. As the price of the Coleman model is quite reasonable, it’s often considered to be the best budget backpacking sleeping bag available for purchase. Therefore, if you have a limited shopping budget, it’s worth the time to take a look at the Brazos and its built-in features. Incorporating an innovative Thermolock system, the sleeping bag from Coleman minimizes the amount of heat that escapes the interior while camping in the great outdoors. In addition to that, the use of FiberLock construction keeps the insulation value of the bag consistent as time passes by which extend the lifetime. Finally, if you need to pack up and leave, Coleman Brazos and its Roll Control design make the job of putting everything away a cinch. As the sleeping bag is machine washable, it requires little effort to clean the Brazos. On its own, a single Coleman Brazos is good for one backpacker at a time. However, if necessary, you could combine two of them together to form a much bigger sleeping bag without much difficulty. The zippers of the sleeping bag utilize a no-snag design which means you could pull them up/down smoothly. As Coleman backs the sleeping bag with a 5-year warranty, it’s a cost-effective purchase for first-time backpackers. You are unable to secure a sleeping bag for extreme weathers because of your height? If that happens to be the case, Coleman North Rim might just be what you need with its excellent length. Capable of accommodating backpackers as tall as 6 feet 2, the Coleman model suit the majority of body build with relative ease. Designed with a rating of 0°F, the sleeping bag functions extremely well even when the temperature drops below freezing point. 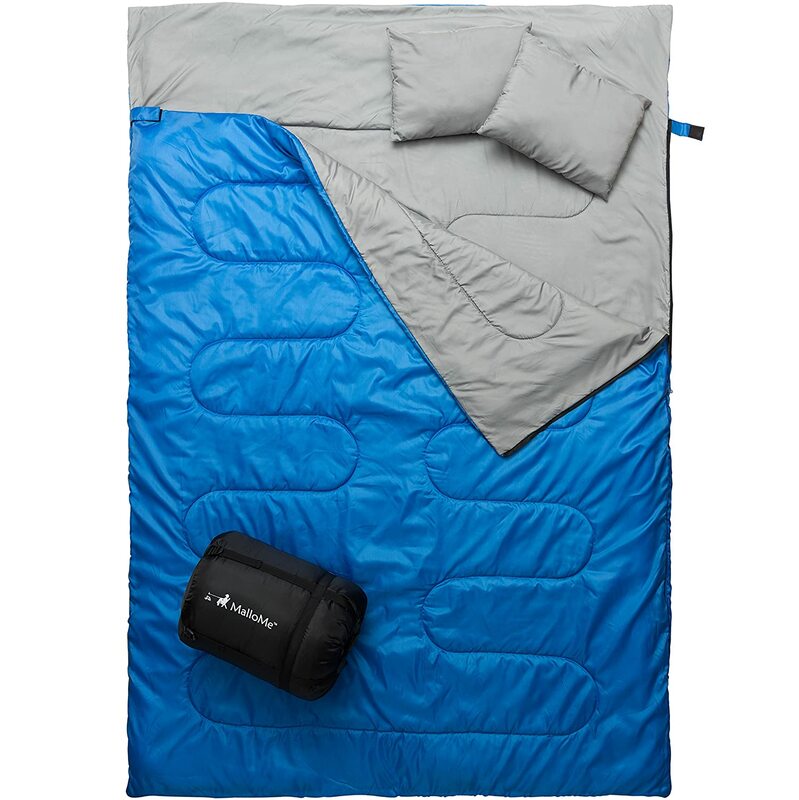 To eliminate cold spot, the product from Coleman employs a quilting construction that keeps the backpackers warm at all times. Moreover, people are able to adjust the semi-sculpted hood of the bag using the drawstrings to reduce the loss of heat at their head. At the very bottom of the North Rim is a spacious box-shaped compartment for the feet so you could roll around conveniently while sleeping. In the case you want to use Coleman North Rim as a 3-season sleeping bag, unzip the bottom on warmer nights to get more ventilation. 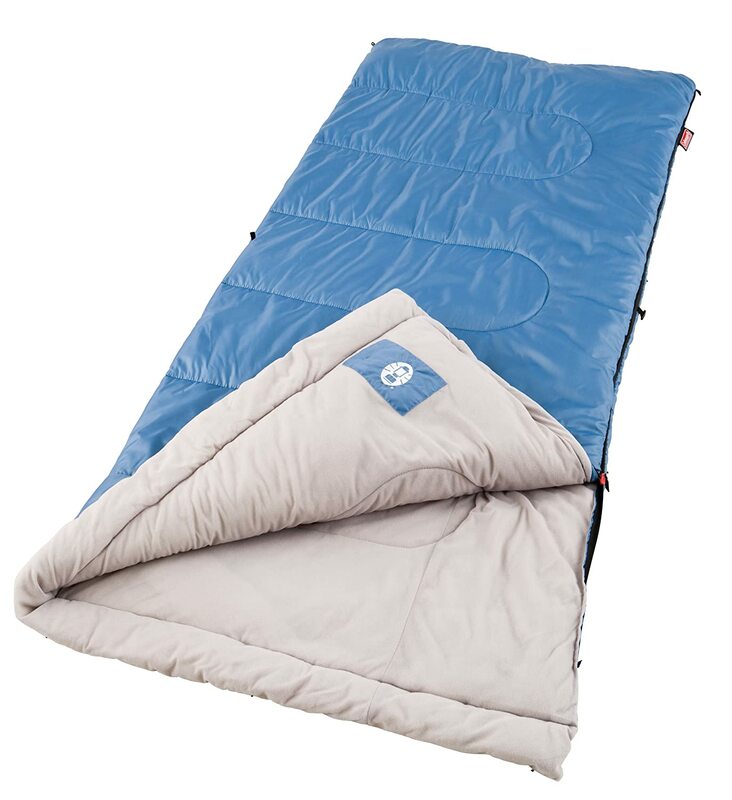 As with many Coleman sleeping bags, Coleman North Rim features a Thermolock full-length draft tube to decrease heat loss. Because of that, the temperature inside the sleeping bag is always maintained at reasonable levels. Aside from the sleeping bag itself, Coleman also provides backers with a free stuff sack after they make the purchase. For people that only go on occasional backpacking trips every once in a while, Coleman Sunridge would definitely prove ideal. Although it lacks features of the best backpacking sleeping bags, the Coleman model is a popular option when it comes to camping in mild weathers. Furthermore, because the acquisition cost of the sleeping bag is comparable to a pack of soft drink, it attracts the attention of budget-minded backpackers. The profile of the product from Coleman allows it to accommodate people up to the height of 5 feet 11 inches, not exactly impressive but still adequate. Using the ZipPlow system, the Sunridge ensures that people could operate its zippers at moment notice without experiencing snagging issues. Generally speaking, the ZipPlow system relies on a zipper guide to gently push fabrics out of the way as the zippers go up and down. Therefore, you no longer have to struggle with the zipper. In term of packing, you would be able to pack Coleman Sunridge without much difficulty thanks to the Roll Control layout which locks the edges of the sleeping bag together. In addition to that, you also have a Quick Cord to secure the sleeping bag after you finish rolling it. Hence, it should not require too much effort for backpackers to transport the Sunridge for a long period of time. Overall, different backpackers have different ideas when it comes to the best backpacking sleeping bags in these kinds of days. Nonetheless, people generally agree that you must assess certain aspects of a particular model before you could decide if it’s suitable for the trip. To tell whether the bag you are seeing is a worthwhile investment, take a quick glance at its temperature rating. For 2-seasons travels, the rating should stay around 32 degrees Fahrenheit. In the case your adventures take place around year excluding winter, it’s a good idea to keep the rating between 32 and 20 degrees Fahrenheit. Finally, if you have interests in cold-weather explorations, look for cold weather sleeping bags with ratings below 20 degrees Fahrenheit. Use weather reports in order to figure out the rating that your bag must have. In backpacking, the sleeping bag is one of the heaviest items that you need to carry so it’s wise to prioritize weight-saving models. The last thing you want to experience is to drag yourself forward with a bulky bag that weighs you down. Fortunately, advances in fabric lead to introductions of ultralight sleeping bags that backpackers are able to carry with relative ease. Nonetheless, it’s worth noting that most ultralight products nowadays often have a hard time coping with extreme temperatures so you have to be careful. 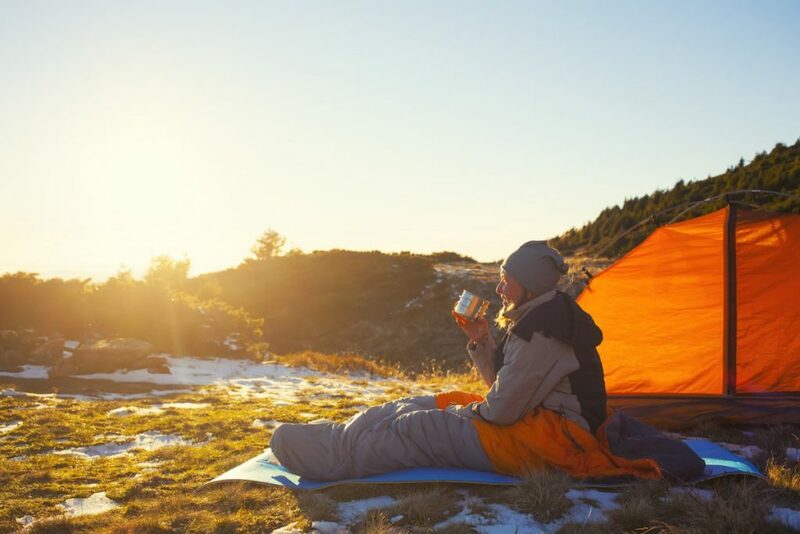 Considering the role of the sleeping bag, it’s strongly recommended that you refrain from treating it roughly to preserve the quality of the material. However, avoid buying models that utilize thin, prone-to-tear fabric as they would not last long on the field. No matter how careful you are, there is a good chance that you might expose your sleeping bag to sharp, rough objects now and then. So if you don’t want to see your brand new bag punctured after a short time, invest something that could deal with some abuses. Backpacking is all about optimizing inventory space which means everything you carry should take the lowest amount of room possible. Regarding the sleeping bag for backpackers, you would have an enjoyable time on the road if you use a model that scores high at compressibility. In fact, people that value mobility while moving in the outdoors think of compressible products as the best sleeping bags. With such products around, you could bring along more stuff to use in the trip without having to make compromises. Normally, all backpackers want to buy the best backpacking sleeping bags but few have the budget to support the purchase. In most of the case, unless you have specific needs and requirements, there is no absolute need to go straight for premium-grade sleeping bags. Look around the market carefully and you should be able to get solid products at reasonable prices since the best backpacking sleeping bags are not always the most expensive ones. That being said, buy from reputable brands in the business just in case and steer clear of dirt-cheap products. 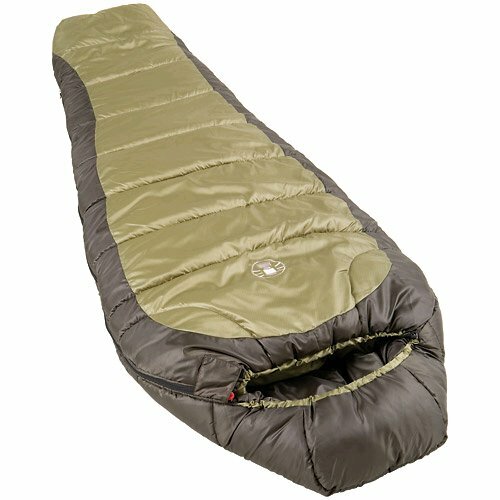 While reading reviews about best sleeping bags, it’s likely that you would come across arguments/debates about the style. Some backpackers feel that traveling with a synthetic model is more convenient but others think that down products perform admirably. So let’s see a summary of the styles in order to decide which one offers the best sleeping bags. For most of the time, down sleeping bags tend to be superior to their synthetic counterparts in term of longevity. Assuming proper care, models in the down category last considerably longer than synthetic sleeping bags. Moreover, down products also have better warmth-to-weight ratios in addition to being highly compressible compared to synthetic units. On the downside, the majority of down sleeping bags have high acquisition costs (almost double the price of synthetic models). Aside from that, most down models quickly lose their insulation quality if they get wet. For budget-minded backpackers, the sound price of synthetic products is the reason why there are onions that they are the best backpacking sleeping bags. You only to pay a couple hundred dollars to own a top-tier model so if you are in a tight spot, go for synthetic. Furthermore, the nature of synthetic allows the material to retain heat in wet conditions which is quite handy if you got caught in the rain. Regarding drawbacks, synthetic sleeping bags are somewhat heavier than their down competitors and the effective time is far from impressive. 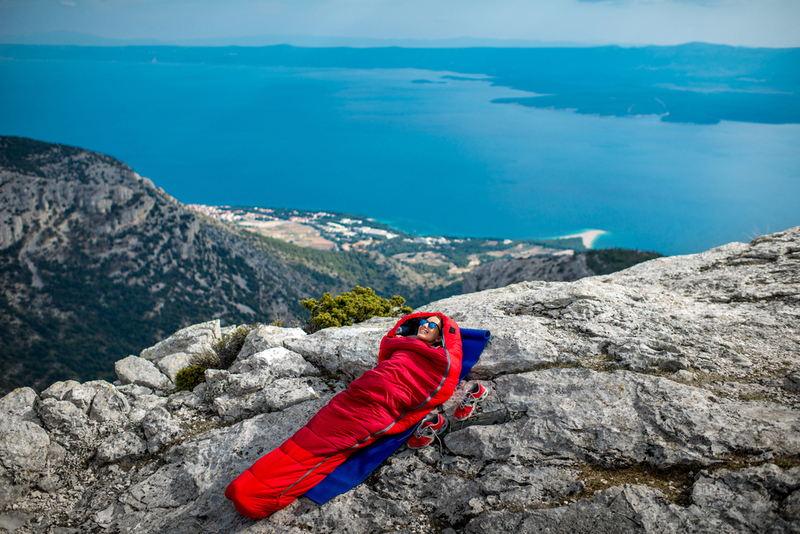 Modern-day sleeping bags incorporate a wide variety of features to meet the taste of backpackers like non-snagging zippers, draft collars, ventilated foot boxes,…Usually, the features would help you face condition in the outdoors much better than before. However, having the best backpacking sleeping bags is rather meaningless if their features cause too much confusion while being used. So if you are shopping for best sleeping bags, you must check out the features of different models and then learn the way they work.